When the subject of legendary haunted houses comes up, the discussion doesn’t get very far before The Edge of Hell & The Beast of Kansas City leap into the conversation. These haunts are a quandary, seeming to exist in a realm between fact and fable, universally renowned yet somehow still enigmatic in the haunt community. They are some of the oldest in the business that I have heard of, The Edge at 35+ years is perhaps the longest running professional haunted house around . They are source of inspiration and admiration for generation after generation of haunted attraction owners, without a doubt the origin of many urban legends relating to our industry. I had heard so many tales about giant snakes and massive slides that I had always planned to go. Therefore, when I learned that Full Moon Productions (The owners of The Beast and Edge of Hell) had created two more haunts the deal was sealed! Now the colossal Chambers of Edgar Allen Poe and the massive Macabre Cinema have joined The Edge of Hell and The Beast, further cementing Kansas City as the mecca for haunted house fans! The first weekend in November after the season in 2008 I had the chance to see all four of the attractions in operation and it was a truly eye opening experience. These haunts were amazing, utterly unlike most of the events I have seen all over the country, and in many ways extremely different from each other in the way they approached the guest experience. In the next few pages I will attempt to capture the essence of these shows, not so much in a scene by scene description (I will save that for you to experience!) but rather in an examination of how it feels to go through them. Of course we must begin with the granddaddy of them all, the venerable Edge of Hell. Like all of the KC haunts it is a multi story building in the area of Kansas City known as the West Bottoms . For those not familiar with the town, The West Bottoms is cluster of cool old buildings off to the west side of Kansas City proper. Approaching this collection of structures on a cold November day is a pretty wild experience for a haunted house fan! They are historic, full of amazing classical architecture, almost a little town to itself nestled at the foot of the higher ground the city is built on. With the ghosts of the stockyards stirring in the atmosphere, the West Bottoms is the “Orginal” Kansas City. By in large the area seems quiet with little activity on the streets, very clean and safe, but somehow the essence of Halloween still hangs in the air. All around you are these insane 4-5-6 story structures featuring gigantic banners of the haunts they house within them. From the top of The Edge of Hell gargoyles can be seen perching, looming over the infamous 12th Street Bridge that runs by the haunt. Permanent signs with Hollywood style lights offer other glimmering hints about the horrors contained inside. Most notably the massive spiral slide that snakes up the side of The Edge of Hell almost mimicking its other famous inhabitant lurking within, a massive LIVE python. Just seeing this slide gets you jazzed for the thrill it will be to go down it later. A feeling similar to the one you experience when you first get in line for a roller coaster! As evening falls the area takes on a new life. As anxious patrons walk between the haunts, a massive sound systems pump howls and growls into the night air giving it a festival type atmosphere. The Edge of Hell is a somewhat narrow building but quite deep, a trait accentuated by the empty lot to its side. As you approach to buy your tickets, you meet the resident street character, the Rat Man. He is a twisted fellow who freaks out guests by putting live rodents in his mouth. The Rat Man has lived at The Edge of Hell for over 22 years and has a following of his own. The secret to not being bitten? There is no secret, he says, you just get used to it! Like all of these haunts, the Edge begins with an ornate lobby with a steep staircase, with the actual haunt starting on a higher floor. You ascend the grand stairs to see a large demonic projection appearing in a huge mirror at the top of the landing beckoning you forward. As you turn to enter the haunt this is quickly followed by a devilish animation that shoots out of the next painting you encounter. After this first quick shock you begin your exploration of The Edge of Hell! This haunt is an exceptional event that really digs into your phobias. Most of it is very dark, very tight and full of steep unusual ramps and staircases that totally throw off your sense of balance. If you are claustrophobic this place will really mess you up! Since this event has been around so long it has been able to use these cramped spaces and wild elevation changes to great advantage in a way most haunts are unable to do. These voids are interspersed with amazingly detailed scenes that set up the scares that then occur later in total and near darkness. One of the more famous ones involves your encounter with the massive snake that makes The Edge of Hell home, the largest python in captivity in the United States! After getting up close and personal with this REAL snake, just a thin Plexiglas wall holding it back, you then get nailed by snake puppets, air blasts and other related serpent scares that work on the fears the real animal first evoked! Another spectacular scene is a long suspension bridge over a jungle. Going from tight claustrophobic settings to this unstable fear of heights situation works very well. As you grip the ropes passing elephants and other jungle creatures an animation almost lands on you for a very solid jolt! There are a number of mansion /crypt type scenes in the haunt, one featuring a fireplace crawl but some of the ones I liked the most were the very unusual sets founds towards the end of the show. You enter a temple, avoiding a huge snake and see a massive Pepper’s ghost illusion of a scantily clad temple dancer enticing you forward. It works as a distraction for a leaping corpse, sure to scare lots of visitors. The overall scene of an ancient world temple really impressed me, it is just something you don‘t often see. Nearing the end of the show you actually go through HEAVEN with angels playing harps in a columned fabric draped room before being sent back to hell - via the dreaded 5 story spiral slide! The slide itself is insane, a twisting nightmare that seems to go on forever. As you shoot out the bottom a devil grabs your hand and pulls you up. Trying to escape the elements of Hell after such a journey is a RUSH like no other! Other innovative things found at the Edge include a fiber optic star field and a very well done flying actor that zooms back and forth over you just before you descend the slide. Like all of these haunts the Edge featured some absolutely amazing audio scares, the clarity and power of which really blow you away. I must say I have never been in a haunt like the Edge that so embraces tight, elevation changing dark spaces to such good effect except perhaps The Chambers of Edgar Allan Poe. Although this event is so well known I haven’t really seen many people outside of the other KC haunts attempting to pull off things like the suspension bridges, slides and use of live animals like they do in the Edge, it’s place in haunt urban legends is very obvious! I particularly liked the theming, the temple, the slide and other elements so unusual and in many ways still fresh even after 35 years. The Beast features TWO slides, the first smaller one taking guests from the swamp down into historic London, a vast set that appears to be the cobbled streets of an actual city. This scene leads (after a tavern sequence) to the most massive set of all, the werewolf forest! This room is so large it fills an entire BUILDING next to The Beast. Here you are allowed to wander through dense fog between actual trees until you FINALLY find your way out, all the while being stalked by werewolves lurking in the gloom. Most haunted houses attempt to create uncertainty about the path the patrons should take, but usually that confusion can last scant seconds or minutes. In the werewolf forest you can be lost for 15 minutes or more - an experience most events don’t have the space to even consider. Eventually you escape to confront a HUGE beast, and then continue to a series of elaborate torture scenes. After a long climb up a bell tower like stairway (that reminds me of the stairway at the climax of the first Michal Keaton Batman movie) you get back to a series of rooms more to a normal scale you might expect in a haunt. Here you experience many things including some torture illusions, massive thunder crashing around you, pocket mazes, repeating rooms, an antigravity room, a duplicate set repeated several times designed to confound and one of the best drop portrait gags I have ever seen. Finally after arriving on the castle battlements it is time for the BIG slide, a straight 4 story plunging drop of utter horror into the darkness. The Beast is just insanely huge, and the open format scenes are absolutely original. At times it felt like being on an unguided haunted trail out in the woods, but it was in a building! This lack of “walls” in many places made it exceptionally memorable, as did the powerful crisp audio that blasted you with each attacking animation, and the many unusual and clever scares found here. Unique to this event was also the feeling of being actually lost in a haunted house without benefit of a maze (although they had those as well!) The Beast like the Edge is absolutely a must see unique haunted house experience. Next on our journey was the Chambers of Edgar Allen Poe, a charity event themed after the works of the iconic horror author. Although reasonably new to Full Moon, this building has housed a haunted house for a LONG time, previously it was known as The Catacombs. Its former owner who I am sure many of you knew was the late Dennis Kingsolver who passed away in this very haunt working on a special effect. Full Moon purchased the building, keeping some of its unusual features while totally redoing the themeing and art of the place. I really liked this show! The building appears tall, narrow and deep much like the Edge, but it was deceptively enormous inside. Since it had no slide to take you back to the ground floor, a vast amount of time in this haunt was taken up ascending and descending tight stairwells in dim light including an actual spiral staircase! Like the Edge it had an ancient feel and was very claustrophobic. Many times you would be forced to crawl or in some cases traverse extremely tight corridors in total darkness. As if it wasn’t tight enough, it featured very long airbag claustrophobia tunnels that really drove home Poe’s tales of being buried alive! At the beginning of the show you ascend several flights of steep stairs to the study of Poe himself. The actor playing Poe is so motionless, when he moves it really scares the heck out of the patrons. Then you go down a hall where the infamous Raven perches on the bust of Pallas Athena just like the classic Gustave Dore prints, and then into the House of Usher, full of twisted actors ready to freak you out. The actual stagnant black water and the stunning façade of Usher really set the mood for the rest of the event. Many Poe stories are portrayed, Murders in the Rue Morgue, and the Tell Tale Heart chief among them. 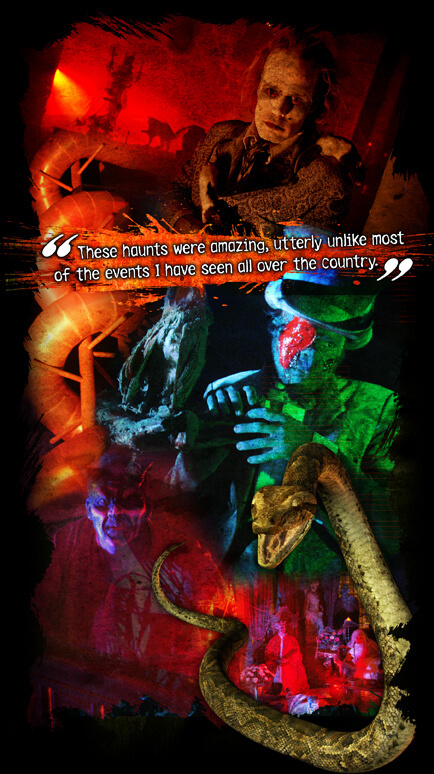 This show also features some awesome two story Pepper’s ghost illusions, a detailed graveyard that is an actual re-creation of Poe’s gravesite in Baltimore, a suspension bridge over a wax works, a mirror maze, an ankle grabbing Black Cat and an actual carnival style spinning tunnel capable of sending the unaware helplessly tumbling! The entire presentation is dark, creepy and ghostly, really effectively relaying the feeling one gets from reading Poe. The final event was a crazy cantilevered rocking bridge and boiler room scene, another unique way to finish a haunt. The final show Macabre Cinema was also another former long term Kansas City Haunt, (The Main Street Morgue) recently acquired and re-themed by Full Moon as a charity event like Poe. While the other events had more esoteric themes (Heaven and Hell, A New Orleans bayou, The Middle Ages, Poe) this one paid more of homage to the classic horror movies so many of our patrons love to be scared by! This haunt was massive, perhaps almost on the scale of The Beast. It was difficult to say just how big the structure actually was as it seemed to connect up with other buildings, and many of the rooms were cavernous like The Beast, much as Poe resembled the tight spaces of the Edge. As in the other shows you ascend a staircase to start. The opening of the event is a descent through a haunted 1930’s movie theater that is actually playing a movie. 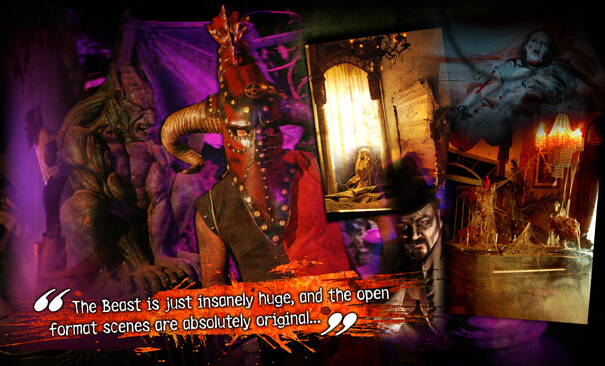 You slip through a slit in the movie screen and live inside the actual movie sets of horror. Quickly you head below ground to what appears to be the actual basement of the building to experience scenes that had the feel of The Silence of The Lambs or a Nightmare on Elm Street. This was amazingly effective as the walls were actual stone, and in many places busted out in a jagged manner to provide path. No vacuform here, but rather rock, mortar and dirt! Our encounter with a creepy old man in a real boiler room was pretty intense! Many, many other scenes were presented, in gruesome tableaus reminiscent of such classics as Friday the 13th, The Mummy, Saw, Candyman, Frankenstein, Hellraiser, Evil Clowns, and a very detailed vampire bar! Some of the sets are the “true” move sets from Hollywood. One scene covering what must have been an entire floor of the building was a vast fog choked graveyard, resembling the werewolf forest in The Beast. Full of free standing buildings, crypts and fenced off graveyard areas, it was possible to wander lost for a huge amount of time. This was only exacerbated by the occasional wandering gravedigger or zombie who would helpfully point you in the WRONG direction! This show definitely followed The Beast’s lead with several open format rooms, then mixing in a more classical scene based layout. Some of the actors here as well as Poe were full of theatrical gusto, and really made the sets come to life, especially a particularly nimble fellow in an asylum/hospital scene. This has to be one of if not the best movie inspired haunts I have ever seen. Overall I left Kansas City amazed. Most haunts around the country are on level surfaces with slight stairs and gradual ramps. Going through these events was a hike, akin to mountain climbing punctuated with crawling in places! The absolute sense of AGE permeates the buildings and the vast SPACE often employed is extremely unique. Most haunts focus on detailed sets with specific gags or effects sprinkled throughout but this place focused more on the FEELING of being LOST, fear of HEIGHTS, TIGHT spaces, and phobias punctuated by REAL animals. Many of the sets were skillfully detailed, often filled with what felt like REAL antiques, REAL trees and other bits of history brought here from other places. The haunts also managed to be very different from each other, each one staking out certain themes, mixing up the charity/pro haunt elements, and the particular strengths of the individual buildings. NOWHERE have I experienced slides like this in a haunt…a great use of the building’s height to really develop the dread of patrons as they come ever closer to the finale of the show. We swung by the haunts one last time the morning before our flight, marveling at the buildings that held the horrors we had experienced as a bitter November wind whipped about us on the empty streets of the West Bottoms, an almost surreal experience. If you own a haunt, are a haunt fan or just love being scared, you owe it to yourself to one day make the trek to Kansas City to explore some of the best and most unique haunted houses in the world! Haunted Houses in Kansas City, Missouri are some of the scariest haunted houses in America. 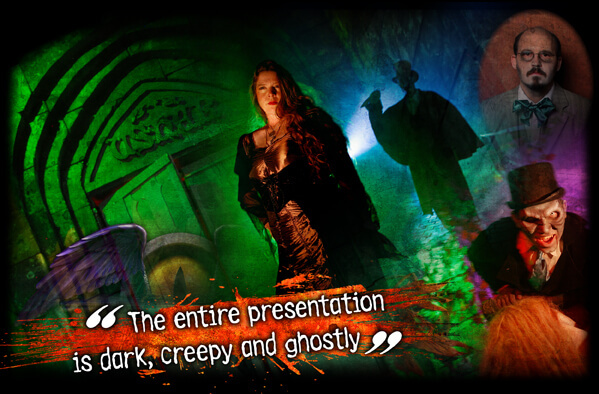 Hauntworld.com tries to review only the best haunted houses in Kansas City, Missouri. When you are looking for simply the best, scariest, haunted houses in Missouri there is no other place to search than Hauntworld.com which offers our guests the best information to find Missouri Haunted Houses including the best haunted attractions in Kansas City, Missouri. 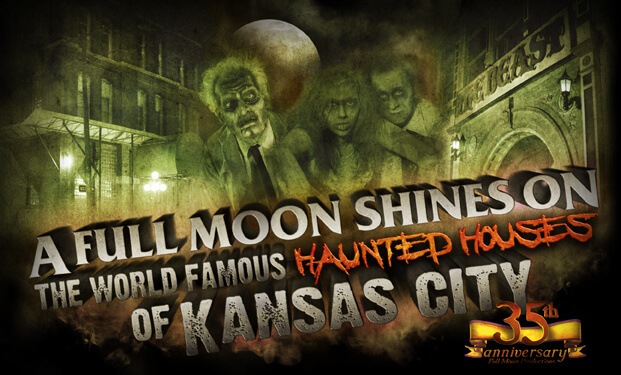 There are many haunted houses in Kansas City that claim to the best haunted attraction but only one can truly lay claim to the being the scariest haunted house in Missouri... Full Moon Productions Haunted House in Kansas City, Missouri.